With McGary sidelined, what’s next for Michigan? The team announced that Mitch McGary would need back surgery, which was performed on Tuesday. The beginning of 2014 was always going to be a big test for John Beilein and the Michigan Wolverines. It wasn’t supposed to be this bad, though. The change in the calendar meant the beginning of Big Ten play, and a chance for the Wolverines to see how well they could handle college basketball’s toughest conference. They would have to do without Trey Burke and Tim Hardaway Jr., who are both facing their own challenges as NBA rookies, but Michigan was counting on Mitch McGary to be a leader on and off the court. After a quiet freshman season, McGary exploded onto the national stage with a series of outstanding performances in the NCAA tournament. In a span of three weekends where he dominated better-known players from highly ranked schools, McGary went from an unknown reserve to someone who was being projected as a lottery pick if he chose to leave Michigan after one season. 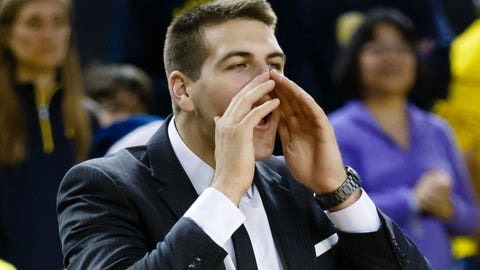 Like Glenn Robinson III, though, McGary decided to stay with the Wolverines for another year. Everyone expected the move to be a smashing success — he was chosen as a AP Preseason All-American and Michigan was rated high in the early polls despite losing their two best players. McGary, though, didn’t start fall practice with the team due to a mysterious back injury, and despite many optimistic reports about when he’d be back in action, he wasn’t on the floor when Michigan started the season. He returned for eight non-conference games, playing reasonably well, but re-injured his back and missed Michigan’s one-point win over Stanford on Dec. 21. The team then announced that McGary would need back surgery, which was performed on Tuesday. He tweeted "Let’s rock and roll" on Tuesday morning, along with a picture of himself being prepared for the operation, and then "Thank you everyone for your support! I’m feeling great! #GoBlue" about five hours later. No one has given a timeline on McGary’s return, but with Big Ten play underway, there seems very little chance of him playing again this season. He is expected to make a full recovery, but will face another decision about the NBA, especially if Robinson decides to go. Obviously, the injury will put a large question mark over his draft stock, so he’s going to likely be back in school this fall. Unfortunately for Michigan, they can’t put the basketball program on hold while they wait for McGary’s return. His role will be filled by the two players that he replaced last March — Jordan Morgan and Jon Horford. Horford had a big game in Michigan’s Big Ten opener, putting up 14 points and nine rebounds in a three-point win at Minnesota, and the duo combined for 15 points and 16 rebounds in Sunday’s rout of Penn State. That’s a promising start, although Morgan needs to avoid the foul trouble that kept him on the bench for most of the game against the Golden Gophers. If they can combine for anything like a double-double over 40 minutes, it will keep the center position from becoming a major weakness. Robinson hasn’t had the breakout year that Michigan hoped for — he is struggling badly with his 3-point shot — but he is averaging 13.4 points, nearly five rebounds and is good for at least one highlight dunk per game. Nik Stauskas, on the other hand, has taken a definite step forward. Last year, he was known as the kid who made incredible YouTube videos but couldn’t duplicate that prowess in games. This season, he’s hitting over 45 percent of his 3-pointers and has added the ability to drive off a shot-fake while also getting better at finding a open teammate when teams try to take away his shot. That’s got him leading the team in both scoring and assists. Replacing Hardaway has fallen to Caris LeVert, one of the biggest surprises of the season. He wasn’t expected to be a big offensive threat, but he and backup Zak Irvin have meant that Michigan has had a second 3-point threat on the floor to complement Stauskas. The pair do play together at times, so they aren’t an exact one-for-one substitute for Hardway, but at a combined 19.9 points and 5.9 rebounds, they’ve provided scoring and rebounding — something needed badly without McGary. As for the point guard spot, it was clear that no one was going to be able to step in and replace Burke. He was the consensus player of the year, led Michigan to the national-title game and now has Pistons fans wishing Joe Dumars had taken him over Kentavious Caldwell-Pope. Spike Albrecht’s performance in the championship game led many people to think he would be the heir apparent — one coach that faced Michigan during the preseason even said he expected Albrecht to be a key to Michigan’s offense — but Derrick Walton Jr. has started every game. Walton gives Michigan the ability to drive to the basket, and he’s a better defensive player than Albrecht. Albrecht, though, is the better pure point guard, turning the ball over just eight times to Walton’s 28 even though both have 38 assists. He’s also hitting 41 percent of his 3-pointers, which lets the Wolverines spread the floor when he and Stauskas are on the floor with either LeVert or Irvin. All of that gives Beilein a solid eight-player rotation, but there’s not much behind that. Max Bielfeldt would be ninth, and he’s only scored 12 points this season. The rest of the roster is made up of players who won’t play unless there’s a blowout. Is this team going to be in the running for a Big Ten title or a Final Four? Almost certainly not. If they can keep themselves healthy, though, they should slot in as an at-large selection for the NCAA tournament and give their young players some key experience before McGary comes back for the 2014-15 campaign.